Today is a holiday! A Monday to sleep late, for some, and maybe read the paper by the window. A day to dream. Perfect for pancakes. I wish I could invite you over to eat pancakes! I’d make a pot of tea, and probably some bacon, and I’d slice up some sweet oranges. We’d sit on the floor at the coffee table, in the bright patch of sun, with our pancakes and too much maple syrup, and I’d make you tell me everything. Because I’ve been thinking about us. About you, really. Firstly, I’d like to say thanks for stopping by. Really, thank you. And secondly, I’d like to know, who are you? I mean, you know a few things about me — too many things, probably — because I sit here every week and I talk about what I’m doing in the kitchen, what I’m doing out of the kitchen, how I’m feeling (about cookies), , how much pie I’ve eaten (too much, obviously), how many miles I got tricked into running. I type and I type and I talk at you, word after word and story after story, all the while oblivious to who actually constitutes the you in this relationship. So, if you don’t mind, who are you, lovely reader? Would you tell me a little bit about yourself? I’d love to know. How do you take your pancakes? Do you like Beyonce? What’s your favorite Meg Ryan movie? (Correct answer: When Harry Met Sally, closely followed by You’ve Got Mail). If you left a comment and told me something about you, anything really, like maybe what you must have atop your favorite ice cream sundae or what the view from your kitchen window looks like, I’d feel a lot better about our relationship. In the meantime, have some pancakes. Heavy on the maple syrup, for me. And for you? You. I can’t wait to meet you! This recipe is courtesy of an intense desire for pancakes coupled with a blatant lack of buttermilk, or any dairy milk, for that matter. I found some plain Greek yogurt and almond milk in the fridge, however, and decided to take a chance. The resulting pancakes are nice and fluffy, with the distinct taste of unsweetened vanilla almond milk and rich melted butter. They are very slightly sweet and lovely, in my opinion. I think they’d do extra well with a handful of fresh blueberries or some chopped banana tossed on top of each pancake before flipping. Melt butter in a large skillet, then set aside to cool. 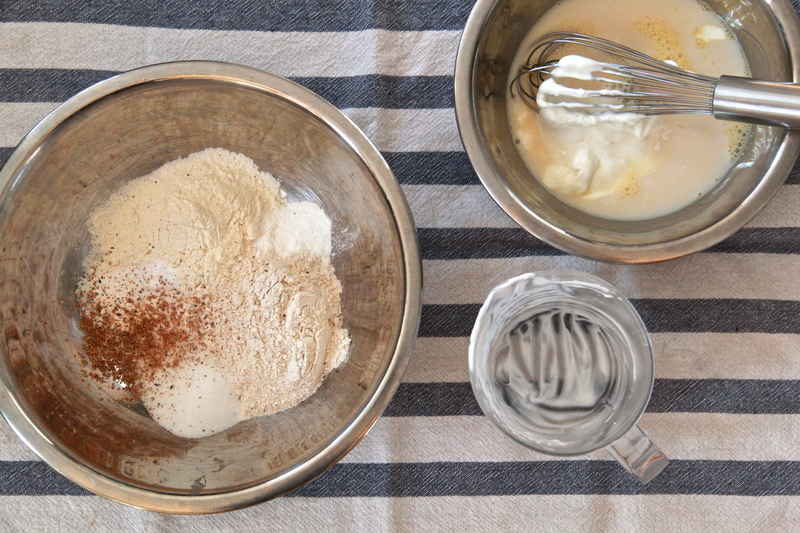 In a medium bowl, whisk together the flours, sugar, baking powder, baking soda, salt and cinnamon. Set aside. In another bowl, whisk together the yogurt, almond milk, egg, and melted butter until smooth. Pour the wet ingredients into the dry and use a fork to combine well. Don’t worry if the batter is a bit lumpy. Let the batter rest a few minutes while you clean the dishes and place your large skillet back over medium heat, with a bit more butter or olive oil to lightly coat. Once the pan is hot, spoon batter by the tablespoon-ful into the skillet, and cook until the pancakes start to bubble gently, about 2-3 minutes. Flip and continue cooking another 2 minutes, or until completely cooked through. Transfer pancakes to a baking sheet and keep warm in a low oven (about 200 degrees) while you finish making the rest. 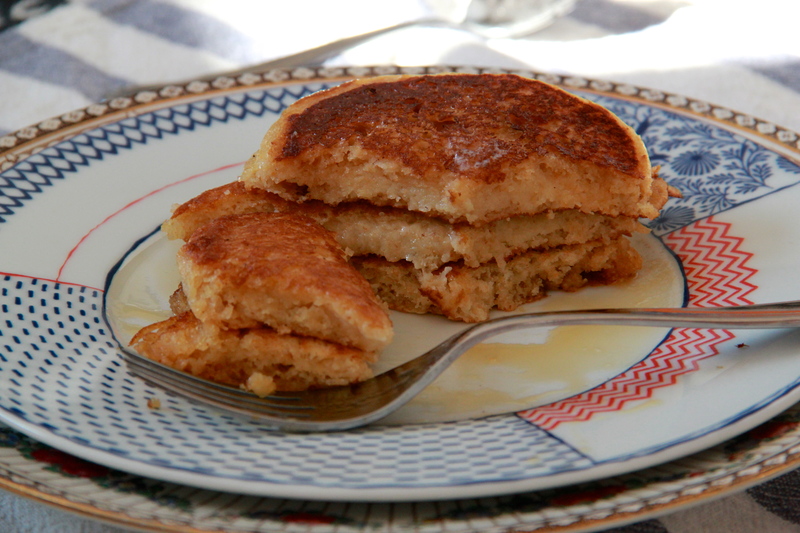 Serve pancakes warm, with extra pats of melted butter and a generous drizzle of maple syrup atop. Makes 6-8 small pancakes, or enough for 2-3 people, depending on the appetites of said people. Yes! Thanks for the comment, Kelly, can’t wait to meet you! I like waffles better than pancakes and I like maraschino cherries on strawberry ice cream. Well hey there! I take my pancakes with lost of butter and lots of syrup. Love Beyonce, especially since the advent of her tumblr (if you haven’t seen it, you are missing out). Those are absolutely the two best meg ryan/norah ephron films of all time. My sundae needs a brownie, and my kitchen doesn’t have a window (don’t cry for me). Love your work! P.S. I too have eaten too much pie. Yay, Sarah! Brownie sundae for the win! I dont really eat pancakes because I prefer eggs for breakfast. But I think I choose eggs because one of my best friend’s names is eggs, and she makes me happy. And so, eggs make me happy. eggs makes ME happy, too! Love you eggs! Those look so good! I’ve never made pancakes from scratch. We usually got the box mix route but I need to try these. Love that you included nutmeg. I usually go light on syrup but I have to eat my pancakes with bacon [crispy] to dip into the sweetness. I think I’m one of the only people on the planet that gets annoyed by Beyonce. But don’t hold that against me. I love Meg Ryan. Any time I see one of her movies is on tv I have to watch, even if it’s almost over. You’ve Got Mail is my favorite because — Tom Hanks. Caramel on my sundae, please. I’d probably eat almost anything if it had caramel sauce on it, to be honest. Absolute agreement with the crispy bacon. Also Tom Hanks. So glad you’re here, Amanda! Octavia turned me on to your fabulous blog. I used to work for Mabry and she was also a dear friend. And now, ever so lucky me, I get together with Octavia once in awhile and I get to hear stories about the family. I eat pancakes once in a blue moon but they were the first thing I learned to cook, silver dollar size. These look delicious. My favorite Meg Ryan movie is that one where she is a stalker, Addicted to Love. She is so tough in that movie, and nuts. ha! Also, sorry I misspelled your name, Molly! I’ve been reading your blog for about a year now (found you from Smitten Kitchen’s blogroll), but have never commented! To me, Beyonce is meh, When Harry Met Sally is the ultimate Meg Ryan flick, and pancakes are incomplete without blueberries. I’m on Smitten Kitchen’s blogroll?! How nuts is that? Thanks so much for commenting, Ashley – so glad to meet you! I similarly found myself here through the Smitten Kitchen Good Reads and I’ve been enjoying your blog ever since! If my kitchen had a window, it would look onto my Greek neighbors here in Astoria, NY. Over the past year I’ve become a big fan of pancakes on the weekends (whole wheat with blueberries or topped with roasted apples). I’ve thought seriously about culinary school but haven’t been ready to take the plunge (mentally or financially). Your posts are great inspiration! Thanks! YUM to roasted apples on pancakes. And thanks so much for your kind words, Heather! Katie over at Second Serving told me about you and I have really enjoyed your site. 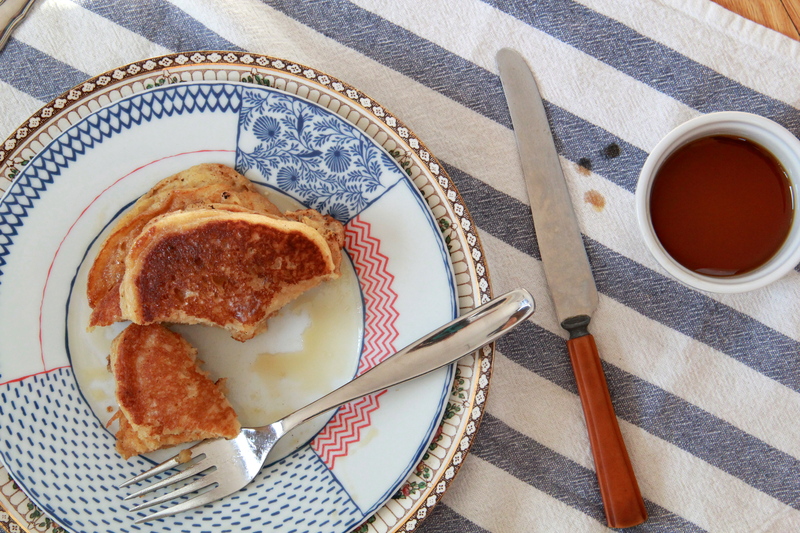 I love this post about pancakes and it sounds a lot like how I would go about enjoying them. I am a fan of soy milk in my pancakes – I think it makes them fluffier 🙂 And will have to try the Almond Milk. I like to eat fruit with my pancakes because it makes me feel better about all the maple syrup. Oh and I have always wanted to be Meg Ryan from You’ve Got Mail. I actually attempted to cut my BROWN (not blond) hair like hers the summer before college. It was awful. I looooooove me some pancakes. Amanda! So glad to know you’re here! I’m keeping up with you through your blog, too 🙂 Say hi to Gordon for me! I’m also here via Smitten Kitchen, so… Hi! My name is Marion, I like golden syrup on my pancakes, and being talked at by people who cook better than I do and take killer photos. Hi Marion! I’m ashamed to say that I’ve never actually tried golden syrup… but if it tastes as great as its lovely name sounds, I know I’m in for a treat. Thanks for stopping by, so nice to “meet” you! Hi Molly! I don’t know if you remember me, but we met at the food styling class in Berkeley! 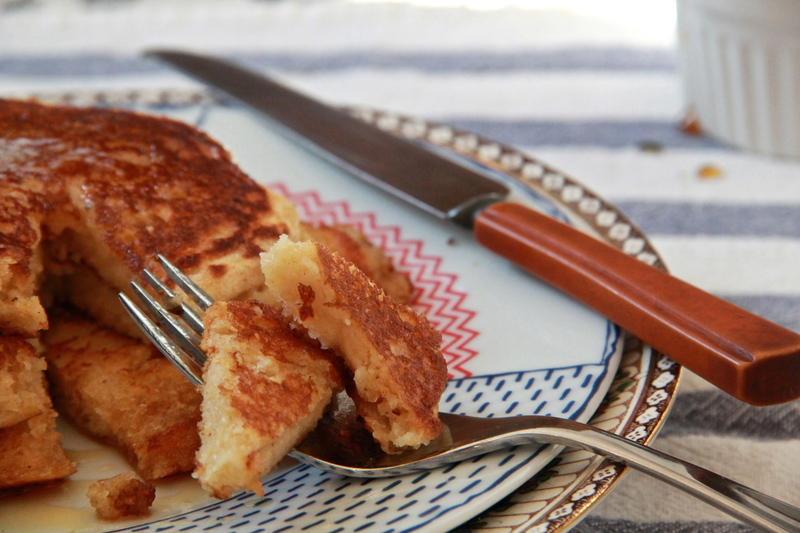 These pancakes look REALLY good… might have to make them this weekend. I like Beyonce. Not sure about the whole lip-syncing ordeal though. But, I have to be honest… I had to google Meg Ryan to figure out who she is! I don’t think I’ve seen any of her movies. I’m in high school… that’s my excuse! Love your blog! I write recipe articles for my school newspaper, so maybe one of your recipes will find it’s way in sometime (properly cited, of course!). By the way, your writing really reminds me of Joy’s (that’s a good thing!). Hey girl! Thank you for commenting! I can’t talk about the lip-synching debacle (so embarrassing), but if you do one thing in 2013, definitely watch When Harry Met Sally. Please, please do this. It’s a thing you will never regret. And keep on keeping on with your lovely blog — I loved the look of those cinnamon rolls you just posted! Thank you, Amy! This made my day 🙂 And it looks like you’ve figured out the secret to pancake success — a husband who will make them for you! Hi hi hi Molly! I woke up this morning feeling quite hungry while sitting on my computer with my cat (I know, I know, allergies…) on my lap and I thought I’d check out your blog. YOU are FanTAStic! And so is your work : ) Seriously, your writing style is conducive to hours of drooling over these recipes and smiling. I thought I’d comment here because I happen to be a huge fan of pancakes. Personally, I throw fresh blueberries on them when they’re just poured on the skillet. Then, I serve them with butter and…powdered sugar sprinkled on top. I learned this from my mother and I’ll never be able to enjoy them more any other way. Anyway, thanks for sharing your gift for creating and cooking via this blog – I will certainly be a frequent visitor! I’d love to cook with you sometime if you’re up for it! Thanks Jenna! You’re too cute. And I think our next “date” should be a cooking party (with or without the menfolk)… I can’t wait! Thanks, Kylie! Did you make them? How’d they turn out? Aaah, so cute! Thanks, Erin! Thanks for sharing this recipe. This is by far my favorite pancake recipe. I make thek for my toddler and I as a snack. We don’t even need syrup with them. I use honey vanilla greek yogurt in mine. Yum. Today I dipped mine in pumpkin butter. I just randomly came across your page! I have been looking for an almond milk pancake recipe for a REALLY long time and so happy I found yours. Made it this morning, and it was DELICIOUS! Added some cinnamon and vanilla extract, but that’s just preference. This recipe is awesome, thank you! YAY! So glad you liked the recipe, Nana! Thanks so much – my bf and I just made a batch of these, with blueberries, and they were spectacularly good. Just for fun, I sneaked a few heaping tablespoons of cornmeal and millet flour into the “whole wheat” part. I also added 1/2 t cinnamon as well as the specified nutmeg. I think you wrote “cinnamon” instead of “nutmeg” in step 2 of the recipe, so I just used both, on the principle that more is more. 🙂 Anyhow, so delicious, thank you!